OMG on my way home from work at 4:45 on March 14th, my Jeep just stalled, dead in traffic... OMG how scary is that? This is NOT a good thing, how does that happen? I was going 45 miles an hour on a 2 lane road with high traffic! OMG, I could have killed someone if the car behind had not been paying attention. Why hasn't there been some type of recall on this? There are more than 39 complaints on this site!!! The first time we needed a scheduled oil change we didn't immediately get one. Our vehicle began shutting off while driving. When we got the oil changed, the technician said there was no oil. I questioned how that was possible since there is a sensor for everything else on the Jeep why was there no indication oil was low. Never got a response to his but it seemed to fix the problem once the oil was changed. Yesterday I was driving my 2016 CHEROKEE LATITUDE 4X4 & was stopped at a red light & the car shut off & an error message came up on the screen to put the car in park & restart! It was startling to me to happen in traffic & cars were behind me so it took me a few minutes to register what was going on & try to figure out why. This was the first time it happened to me. A few hours later I was driving again & stopped at a stop sign & it did it again, same day! Then while driving home on the highway another error message pooped up & disappeared, but the A light with the circle around it stayed on until I got home & when I shut it off & restarted it the A light went out. I have never had this issue before and am concerned because Saturday I am driving to nyc by myself & concerned about it happening when I am driving in heavy traffic. I will mention that yesterday was cold, like 10-20 degrees & I had used the auto start option on my remote each time before this occurred. Not sure if that is relevant. Shortly after leaving for work, after a right turn into a short steep uphill section of highway, the car just died. There were no warning lights. The display message said to shift into P then select a gear. The car had no functionality, it was dead and started rolling backwards towards the intersection. Put in park and tried to restart check engine light came on, and was able to operate foot brake which was also unresponsive to that point - panicking that the car would roll across the intersection into the ditch. Car would not however start. Fortunately very early in the morning and no other cars came along. After a few minutes and tries, the car started and drove as though nothing had happened and no warning lights on the display. Called Dan's Jeep from work and arranged to bring it in the next morning. Drove home from work and to the dealer, like nothing had happened. But scared that the problem might repeat and deliberately took backroads just in case. Can't imagine what would happen if I'd taken the Interstate and the problem repeated. - they said there was no oil on the dipstick (so why did the oil light not come on?) - they had changed the oil and filter and the car was good to go (really?) - they recommended bringing the car back after 1000 miles to check oil consumption (so if the car for whatever reason loses its oil will it really be safe to drive? Could it not happen the next mile, the 100th mile?) - they said there was no evidence of oil leaks (yes, we would have noticed oil spots on the floor of our garage) - they said there must be "internal consumption" of the oil (so there should be smoke coming from the exhaust, right? There was not) etc...... going around in circles. The following day (yesterday), went to the dealer after work. The service manager repeated all of the above. He stated categorically that the car was safe to drive. Asked him to put that statement in writing. He said he would. Said that I would use that written statement in the event that anything happened. We never got that in writing. Said that we expected to receive from them the full cost of the car refunded, as it was obviously unfit for purpose, scared to use it. He said that they (the dealer) don't engineer or design the cars (duh, right), and we would have to take the matter up with Chrysler. I asked why the issue was not subject to a recall, as there are dozens of reports of this happening (by then had researched this and other sites, National Highway Traffic Safety Administration). Asked if they, the dealer, had reported this instance. They said they had not, and it would only notify to Chrysler when they claimed their costs and time for the incident (so what about our time, costs, inconvenience - not just the out of pocket, but being frightened to even drive the car). Asked what we were supposed to do in the meantime, as we were not going to take the car away. They said they did not have a loaner (well, would not want a Jeep anyway) and after much further back and forth, they agreed to supply a rental which we'll collect from them later today. A very serious question (or two) in all of this: there is obviously a serious design fault with the engine on this vehicle that does not appear to have been acknowledged by Chrysler or subject to a recall - I guess because the only solution is to replace the engine, but then the same is going to happen, unless re-engineered to take a different design of engine without this fault, and I can imagine Chrysler balking at the cost of that, or having to buy back all of this cohort of make / model / engine combination, probably a few hundred thousand vehicles. But the main question is this: why does the car stop dead (literally dead) when the problem occurs. The dealer said this is to protect the car. Well, thank you Chrysler for caring so little about your customers that you protect your car from damage (assuming stopping in the middle of the highway does not result in an accident). Worse than that, it is putting the car ahead of the safety of the PEOPLE (me, my wife) whoever is in the car. There will be a fatal accident because of this, if there have miraculously not been any to date. Chrysler, get your corporate asses in gear, recall or buy back the cars before you kill somebody. With this many reports and no action over a known problem, I would consider that manslaughter, and every stall attempted manslaughter. I will be contacting my attorney. The issue first happened on Tuesday 10/30/2018 after work, the jeep had been sitting in the parking lot at work for about 9 ½ hours, it was about 60 degrees outside. It started without issue, I drove it out of the parking lot taking 3 right turns, and on the third right turn the engine light and the oil/battery light lit up at the same time that I lost acceleration and power steering. The dash flashed the message “Shift to Park then Desired Gear”. I hadn’t realized it, but the engine had shut off. I tried restarting and it made a noise as if the starter was trying to engage but it wouldn’t turn over. After several attempts I let it rest for 5 min at which point it restarted without any issues and no engine/oil/battery lights stayed on. Drove it home 40+ miles with no issue. The problem happened twice the following morning (this is the 3rd instance in the video) after it sat for about 12 hours, it was about 46 degrees out, I let the engine warm for a few minutes and on my 2nd right-hand turns it dies. Same lights, message on the screen, and restarting issues. It seems to happen during deceleration in a right turn. I took the Jeep into my local dealer and requested a diagnostic. After a couple of hours, they called to let e know it was ready to go home... they did not do a diagnostic as I requested. They chose to do an oil change because they knew from my description what it was. I think its just unconscionable that Jeep has chosen to do nothing about this. What kind of reasonable person would believe that it is safe to have an engine that shuts off to preserve itself, rather than the safety and life of the driver and passengers?! You would assume that a 2-year-old vehicle packed with sensors would be designed to provide the driver with warnings before the engine shuts off. I did contact Jeep, the manufacturer. There was no email address, only a phone number, and chat, so I chatted. The response to my issue was to take it for a second opinion, even though I was told that Jeep is aware of the issue, know what it is, and there is no fix... the representative recorded my complaint and said if enough people complain they will issue a recall.I didn't ask what the definition of "enough" is, so please if this is happening to your Jeep, submit a complaint! My Jeep Cherokee has stalled 5 times in the past 3 days while driving it. 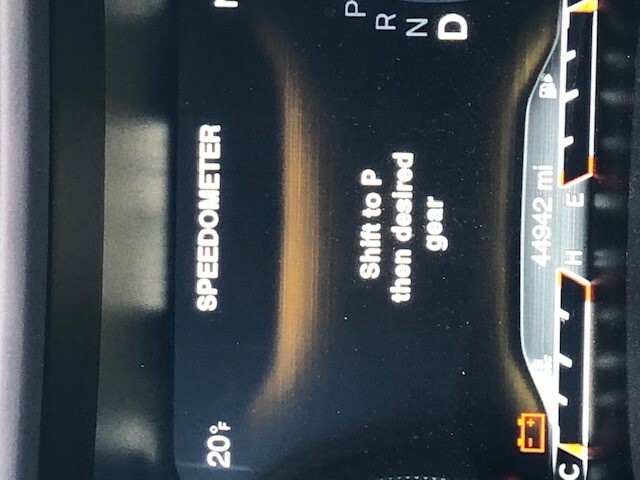 Each time the dash has displayed the message "Shift to P then desired gear". We brought it to a Jeep dealership and the tech was very understanding and tried to diagnose it . It even died on him once when he drove it. However they couldn't trace the problem other than they thought it was a computer issue so they updated the software. However it died on me twice the next morning. It has died 5 times now. 4 times for me and once for the tech. 3 of the times it was while making a right turn. Twice while slowing down for a stop. And all 5 times it was within a mile from my house or work after just starting the Jeep for the first time in 8+ hours. Temps have been in the 40s and gas is full. This Cherokee with low miles stalls out when driving and dealership says it is because of low oil and it is acceptable that the 2.4L use a quart of oil every 1,000 miles so that means the jeep would be out of oil after 5,000 miles. That is no one's world is acceptable. This engine should not use any oil at all. Dealership wants it brought back in every 1,000 miles so they can check they oil. To me fiat Chrysler has already acknowledged there is a serious issue with the number of engines and buy backs they have already done on this engine in several jeep models. I sold these vehicles for 4 plus years retiring last year. So I am telling any owners with this issue not to accept the bs the dealers hand out under instruction from Fiat Chrysler. Demand a STAR case be opened with the zone representative for service with Jeep. On 2/1/19 and 2/4/19 my 2016 Jeep Cherokee stalled while driving it. I was going around 35-40 MPH. The vehicle was able to coast to the side of the road, then it took a few minutes for it to start up again. The onboard computer system does not show any warnings or issues with the vehicle. After researching this it seems several people are having the same problem with their Cherokee's. On my way home from work I just went through a round about and without warning my Jeep just shut off completely. I had to let it coast into the nearest parking lot, but this could have been a real danger in a different situation. A battery light came on when the Jeep died but the Jeep wouldn't even turn over after this. I had to have a tow company come. They came and jumped my car and after that it ran fine. I brought it in to get checked over at the shop and they determined it was low on oil. What they couldn't answer is why it didn't give me a warning about low oil or check engine light. Nothing but problems with my Jeep since I have bought it. Bought the car 10/3/2018 with a fresh oil change, on 12/18/2018 my husband was driving with my children in the car and it shut off and stalled. He waited a few minutes and it started and drove with no lights on the dash. 12/20/2018 car shut off on me while in the middle of an intersection, coasted to the side of the road luckily unharmed and shut off car. Car sat for ten minutes before it would restart. Car the same day shut off again while driving, would not turn on again for 10 minutes and at that point the check engine light came on. Brought into dealer who sold me the vehicle, they performed oil change (I had driven less than 4k miles since car was purchased) and they stated the car had less than 1/2 quart of oil and that is why it was shutting off. Oil changed 12/21/2018 and 1/7/2019 car sputtered and almost shut off, brought to dealer and they stated it is already 1 1/2 quart low on oil, there is no leak no marks in driveway the engine is burning oil at a rapid pace. RUN AWAY FROM THIS CAR! Others warned me against Chrysler and I wish I had listened. Started oil consumption testing 1/7/19 will follow up. I am so thankful I was in a parking lot instead of on the freeway. Yesterday, after work, I drove the car about 10 miles on the freeway. I exited the freeway and pulled into a parking lot, all of the sudden the car made a 'ding' sound, the engine died, steering locked up, the battery light flashed and a notification popped up that said to put the transmission in park and select the desired gear. Luckily, after the car came to a rolling stop, I was able to put the car in park, turn it off and restart it. I called to make an appointment and the soonest appointment they have is 4 days from now. The best part is the service advisor told me it would be nearly impossible to duplicate the problem. Are you kidding me? This is extremely dangerous and needs to be addressed by Jeep. I am afraid to drive this car and had to take an Uber to work today. I pay nearly $500.00 a month for a car that I thought would be safe because it is new and now I feel like it is a death trap. Thank goodness I was still in my neighborhood and didn't make it to the highway! It was super scary especially because I had my 9yr old in the Jeep with me when it just shut off. I was going 25mph and had to coast & then push it to the side of the road. This whole situation could have been more serious if I were going 60mph on the highway. The dealership had it 6 days before they could figure out what was going on. They claim that my Jeep had no oil, they are the ones that do my oil changes so that didn't make sense to me. I have to take it back in 2000 miles for an oil consumption test. The car died about one minute after leaving my house in the morning. It died right after I turned a corner. It's the first time this happened. It wouldn't re-start right away. I waited a few minutes, it started with no issues and drove fine the rest of the day. WHEN I STOP AT A RED LIGHT OR STOP SIGN, THE ENGINE DOES NOT SHUT OFF AND TURN BACK ON. NOW IT WON'T COME ON AT ALL WHEN STOPPED. DASH BOARD GOES CRAZY AND CHANGES EVERYTHING . I TOOK IN AND THEY DIDN'T FIX IT. Two days ago my learning-to-drive teen was approaching a stop sign and the Jeep died. The message to put it in park and restart appeared, and it took several tries of restarting to get it going again. This morning the SAME THING happened again. My poor kid decided he was done, so I took over and it died on me while maneuvering a slow uphill corner. This is not safe! Calling the dealership tomorrow and am hoping its an easy fix. Extra details: I've noticed for the last week or so a "ding" like you get with the low gas/low wiper fluid notices on some corners as I slow, but no message pops up. My change oil light has been on for two weeks. I'm a teacher and was waiting for summer break so I could get it done. My wife was coming back yesterday (6/17/18) from a hike she'd taken her father on for Father's Day. She was going 70 miles an hour on I-90 in Washington state, cruise control on, then suddenly the cruise control dropped off, the LCD that was showing 70 mph suddenly showed zero, and the accelerator no longer worked. She eased it off to the shoulder of the highway and stopped. She turned the car off, allowed it to sit for a moment, then turned it on again and it worked fine as if nothing had happened. There are sections of I-90 through Snoqualmie Pass that are still under road construction with no shoulders. I'm glad that she was in an area with a breakdown lane / shoulder that she could use and that she was able to safely move off the road. This could have been very bad otherwise. Thank you to the others on this site who reported this so that when I call my dealer today I won't let them tell me it's a one-off / unheard-of issue. The car shut off/stalled 3 times today and I'm afraid to drive. I called 2 dealers. First one said they never heard of the problem. (Pants on fire) Second one told me it was low on oil. For sure I checked and car was almost out of oil. I have added oil and hopefully it will solve the problem. Will have an oil change next week. Update from May 14, 2018: Dealer will have me bring the car in every 2 weeks and oil level will be recorded. I was told that Jeep / Chrysler is aware of the issue and if necessary they will replace the engine. Stalling out with no warning in the middle of an intersection. No warning just shut entire car off and a message alert said to put the transmission in park then the desired gear. That's weird, considering that I was already in DRIVE...? The car would not restart for a few minutes then it ran fine. Thank God I didn't have my small kids with me. I pay $430 a month for a car to be reliable not to be scared to stall out at a busy intersection. Jeep needs to recall this! Not good at all! I've started to experience this problem about a month ago where the car just shuts off and stalls while you're driving. It'll say 'put the car in park' and then to gear desired. We couldn't figure out what the problem was and Jeep wanted $129 just to look at the car. I started Googling and ended up on here where plenty of others were complaining about the same thing and I read paragraph after paragraph. I noticed a lot of people were being told that they just needed an oil change. My vehicle started doing this at 57% oil life so of course I didn't think I needed an oil change. But, being desperate I got an oil change before bringing it back to Jeep and paying the $129 so that they couldn't say the same thing to me. I mean it was really bad, it would turn off in my child's drop off line at school, in the middle of the road at a red light, in the parking lot of my job multiple times in a day. It has now been 6 days since my oil change and I think it's safe to say that unfortunately that was the problem. So we have to do oil changes frequently which you wouldn't think with a new car right? We just picked the wrong one. Anyway, NEVER going with jeep again. I really hope this helps someone out. A month or so ago I started my car w/ my auto start, waited a few minutes, hopped in my car and took off. Approx. 1 mile down the road I was preparing to stop at a red light when my car shut off and a warning ding alerted me to a message that told me to put my car in drive, which was perplexing, because my car was in drive. I placed the car in park and tried to restart it and I couldn't. I could hear my starter engaging, but nothing else. It even felt like my brake pedal was locked up. I tried a few more times to start it but it wouldn't. I let it sit for approx.10 minutes and it started back up like nothing had happened. I had no messages stored and no warning lights on. I had the exact same issue happen again yesterday. I drove to my father's house after I was finally able to get my car started again and after telling him what had happened he remembered to tell me that he has noticed oil drips in his driveway (I'm the only one that ever parks there). When we checked my dip stick, there was barely enough oil to register. I have my oil changed regularly, no gauges have ever alerted me to needing an oil change or having low oil pressure. I have an appointment to take my car in next week to the Jeep dealership, but he told me if they are not able to duplicate the issue, it's going to be difficult for them to diagnose the problem. Update from Apr 10, 2018: After having had my car at the dealership all say, they suggested getting my oil changed. They said that when the car is low on oil (even though I've had no bells or whistles going off telling me their is an issue), the engine shuts off to avoid damage. The only issue I have with this, is that my oil was changed on Saturday. When I told him this, he said that perhaps the filter is loose or there is a "double gasket". I asked if they could check since it's there, he told me they could, but if that were the issue causing the engine to stall, that that would not be covered under warranty and I would essentially be paying for another oil change. I think it's dangerous and negligible to design a vehicle where the fail safe is to protect the engine and not the occupants in and around the vehicle! I would much rather blow up my engine than be in an accident where myself & others could be hurt or much worse! It's absurd!